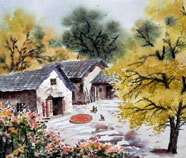 Chinese Village Countryside Paintings for sale! 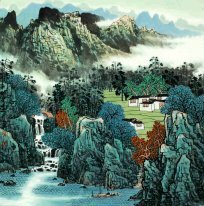 Chinese minority village painting, ethnic village painting, descriping countryside life painting, and rural scenery painting enjoy high favor among Chinese painters, for its strong characteristic of real life. 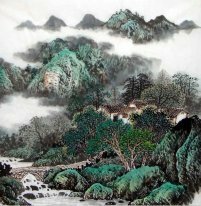 As an ancient and traditional artistic form, Chinese landscape painting seems to be moving towards diversification and gradually form the feature of modern art that under the influence of pluralistic aesthetics of the time. 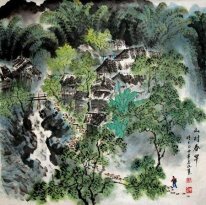 And the subject of village and countryside have become increasingly important in Chinese landscape painting. 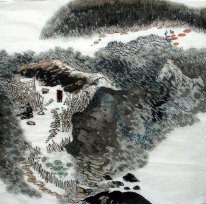 Painters go to archaic town or village, or countryside in midwest of China, or minority villages to experience firsthand local environment and customs there for creating their ideal village paintings. 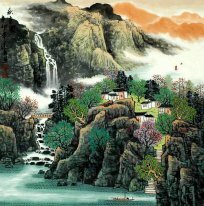 By virtue of their sensitivity of beauty, painters picture a lot of tranquil paintings of rural life. 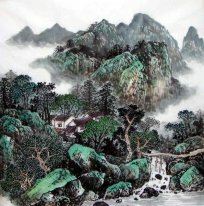 Rows of old-timey tile-roofed houses, or wooden houses on pillars, or thatched cottages, or farmhouses, either can be glimpsed from lush trees or mirror their images on river, full of ethnic style and local characteristics in the painting. The ancient and winding flaggings are motley in color and have remained as they were before, seemingly lead pelple to a quiet seclusion. Ancient trees around village reach to the sky, cloudlike bamboo forest and clear pool, all things seem show the style and features of 50, or 100, even 500 years ago of China. 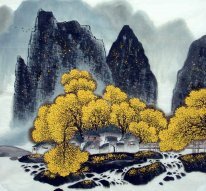 When you appreaciate one painting with typical rural customs and practices, you would feel like back to nature and free from vulgarity.